The gems of fall are scattered all over my yard. It’s a beautiful mosaic which is painted by Mother Nature, with a little help from her friends, the trees, the leaves, the wind and the animals who rustle through the leaves, foraging for food to put away for winter. I love all of the seasons, but for some reason Autumn is making me so happy this year. It’s in the rich tones of the fall colors that intrigue me and have me lamenting that I missed taking so many photos of the changing foliage. 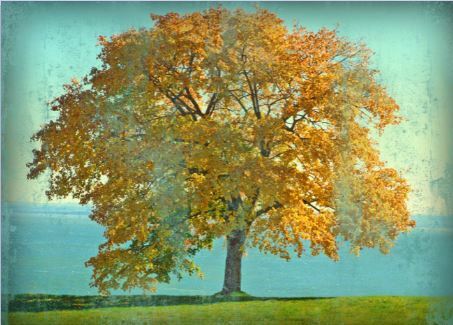 If you have any lovely scenery, please feel free to comment below with your link! I’d love to see your photos! I saw this on FB yesterday and I just loved it. What an intriguing answer to the question of ‘what are we doing here?’ and such a lovely photo of an autumn path. It called to me so I thought I’d share it with you as well. 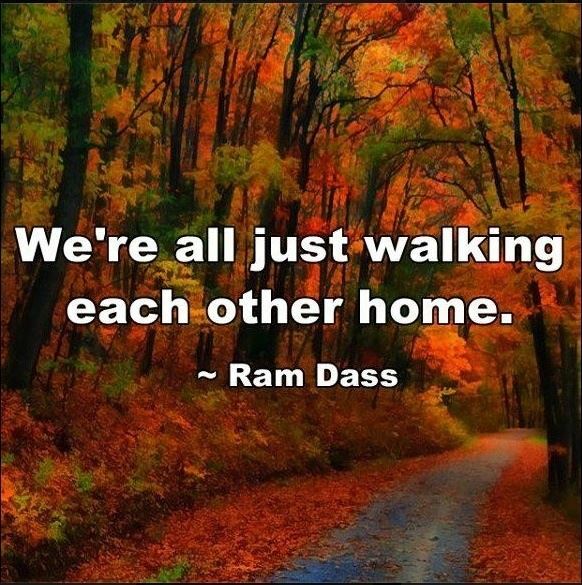 Doesn’t Ram Dass’ quote make it all simple? And it really is when we strip away all the nonsense that keeps us up at night. Imagine if you could take all the people in your life and just see them as folks who are just walking home with you. Wouldn’t you be able to let go of all that annoys you and just allow love for all? So why not take this moment and do just that?! We are all just walking as well as we can on this path of life. We sometimes lose our footing, stumble and even fall, but with help from our inner spirit, God and the outstretched helping hands of others, we can pick ourselves up and continue walking. Sometimes we can only manage baby steps, while at other times, we can skip, run and even dance! Letting go of shoulda woulda coulda’s and allowing yourself and others to just be themselves may not be easy for you, but to release judgement and to allow forgiveness is beneficial to you and to everyone else on the path with you. So today, let’s experiment and just try to view everyone this way!